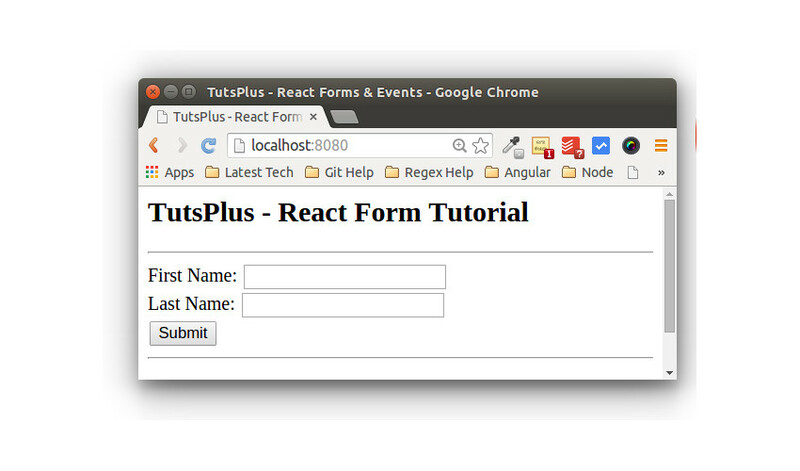 In this tutorial, you'll learn about forms and events in React. We'll start by creating a simple React-based app and then add a form and some elements. Then we'll see how to add events to the form elements. If you are a beginner with React, I would recommend reading the introductory tutorial on React to get started. Initialize the project using Node Package Manager (npm). Fill in the required details and you should have the package.json file inside the ReactFormApp folder. Install the required babel package using npm and save it to the package.json file. Save the changes and try reloading the webpack development server. We have the basic React app up and running, Let's move to the next step and try to create a form component using JSX code in app.js. Create a component called FormComp inside app.js. Render the form component FormComp to display the form inside index.html. Save the changes and restart the webpack server and you should be able to view the form. 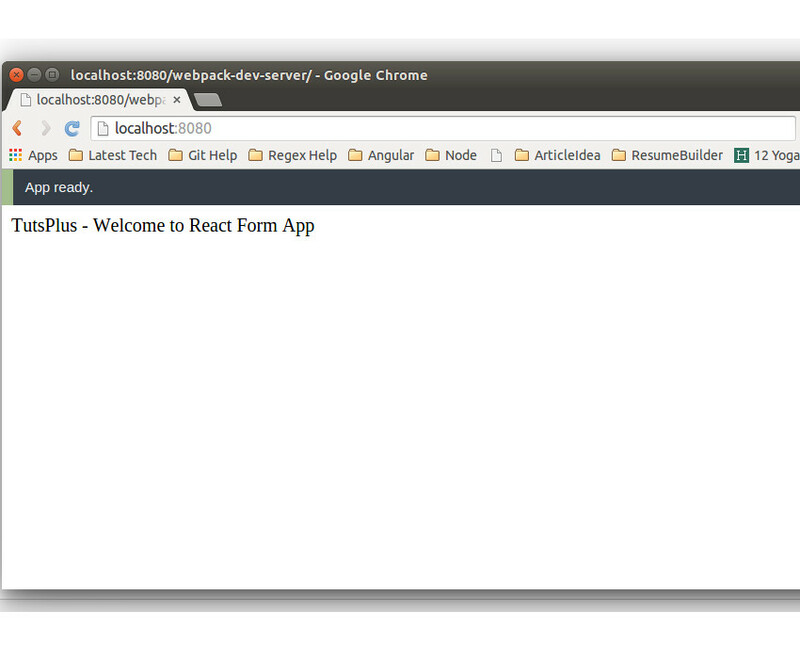 Our React form is in good shape. To make it interact, we need to add events to the form. We'll start by adding state variables on each of the input boxes so that we can read the values of the input boxes. Let's set the state variables for the first name and last input text boxes. Make sure to set the initial state for the above variables. Define the getInitialState function inside the FormComp component and initialize both the variables. We need to handle the on-change event of the input boxes and assign the state variables when the value in the text boxes changes. So define an onChange event on the input boxes. Define the onChange functions inside the FormComp and set the state variables. Let's try rendering the state variables by using them. Inside the FormComp HTML, add the following element rendering the state variables. Save the changes and restart the webpack server. Try to enter some text inside the first name and last name text boxes, and you should be able to view the results as soon as you type. Next, let's add an on-click event to the submit button that we have on our form. Also, initialize the Name variable in the getInitialState function. Display the concatenated full name in the form HTML. Save the above changes and restart the development server. Enter both the names and press the submit button, and the full name should be displayed. 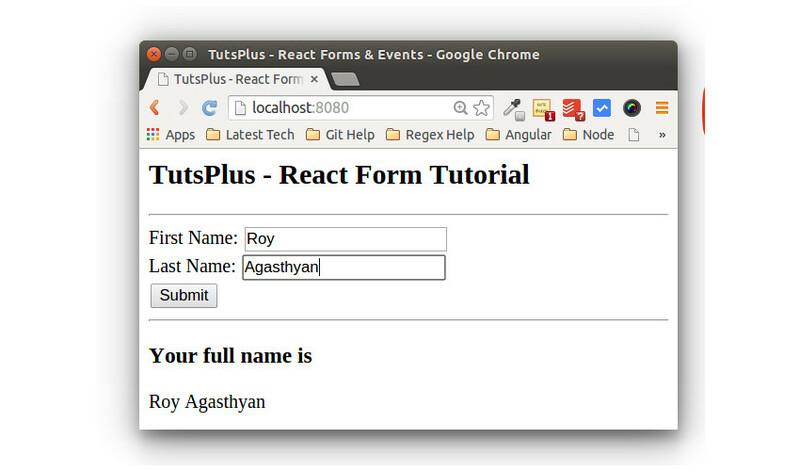 In this React tutorial, you learnt how to get started with creating React apps and understood the basic concepts about how to deal with forms and events in a React-based web app. I hope this tutorial will be helpful for you in getting started with creating React-based apps. Do let us know your thoughts, suggestions or any corrections in the comments below. Keep watching this space for more React tutorials.